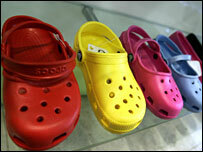 A hospital has banned theatre nurses from wearing popular Crocs shoes - suggesting they might be dangerous. Sheffield Teaching Hospitals Foundation Trust said the brightly coloured clogs might pose a health and safety or infection risk. However, they denied they were worried about reports that static electricity build-up caused by the shoes could disrupt medical equipment. The shoes' maker said they can be cleaned more easily than alternatives. Ward Walkers said that some styles of Crocs were actively marketed to healthcare professionals. A spokesman for Sheffield Teaching Hospitals said staff were expected to uphold a dress code, which was in place to prevent infection, maintain health and safety and keep a "professional image". Under the code, shoes should be black, low-heeled, soft-soled and supportive. A spokesman said that theatre staff had already been told to stop wearing the most popular variety of Crocs - those with holes in the top or side - because of risk of injury from falling scalpels and needles, or the risk of catching an infection from blood dropping through the holes. However, she said that there was no extra infection risk to patients as a result, and styles without the holes were allowed. She said that the trust would be working with staff unions and foundation trust governors to discuss whether the policy could change to include Crocs. In April, a hospital in Sweden banned the shoes after three incidents in which static electricity from staff wearing them was discharged into medical equipment, causing it to malfunction. Bjorn Lofqvist, the spokesman for Blekinge Hospital, said that staff wearing Crocs could produce "a cloud of lightning". However, the Sheffield spokesman said that no similar incidents had sparked concern in the UK. "The Trust has not experienced an incident such as those which are reported to have occurred at the Swedish hospital and has not received any specific guidance from the Health Protection Agency to indicate that any footwear should be banned as a result of interference with medical equipment." Roy Mclean, the chief executive of Ward Walkers, which distributes the shoes in the UK, said that some styles were perfect for clinical use. He said that although many surgical clogs used in operating theatres are designed to release static electricity safely, the issue had never been raised as a concern with regard to Crocs. "The advantage of the Crocs is that they can be washed in a mild bleach solution without any damage - unlike the majority of other shoes used by hospital staff. "I know of two surgeons who use them in the operating theatre, and put them in the sterilising machine afterwards." He said that the most commonly-sold version of Crocs, with holes in the top and sides, was unsuitable for hospital use, due to the danger of dropped needles injuring the foot. Judy Potter, the chairman of the Infection Control Nurses' Association, confirmed that Crocs were far easier to keep clean than conventional shoes, posing a lower infection risk. However, she accepted that styles which had holes in the top could allow blood and fluids from patients to reach the skin. Janet Davies, executive director at the Royal College of Nursing, said: "It is up to each individual trust to put in place risk assessment procedures which ensure the safety of patients and staff in the workplace." The story was first reported in Nursing Standard magazine.